The team at Crowdlinker, minus one employee. (Image: Crowdlinker). When Crowdlinker Inc.’s developers began building their social media tool, they did what a lot of startup founders do when their current tools aren’t working – they just built something new. Housed in Ryerson’s Digital Media Zone in Toronto, Crowdlinker used to be called StartupsN, and it aimed to help startup enthusiasts find each other through LinkedIn and Meetup.com. (We wrote about the company when it won a Startup Weekend competition in Hamilton, Ont. in 2012). The six-person startup now offers a completely different core service, serving up online video hosting for brands that want an alternative to YouTube and Hulu. But the idea of connecting people, the way that StartupsN did, hadn’t really left the team. And when they began doing their own social media marketing, they found a gap in what popular tools like HootSuite and Buffer were offering. “I think every single company, no matter what size, should treat social as a basic need,” says Aram Melkoumov, one of the co-founders and co-CEOs at Crowdlinker. He adds he feels social tools should always incorporate features like analytics, yet HootSuite and Buffer will charge for some of the more advanced analytics as extras. What will set Crowdlinker’s social tool apart is the idea of being able to share content to individual people, rather than blasting it out to all of an account’s followers on Twitter, or all the people who have liked a page on Facebook – something that’s currently not possible with HootSuite or Buffer. 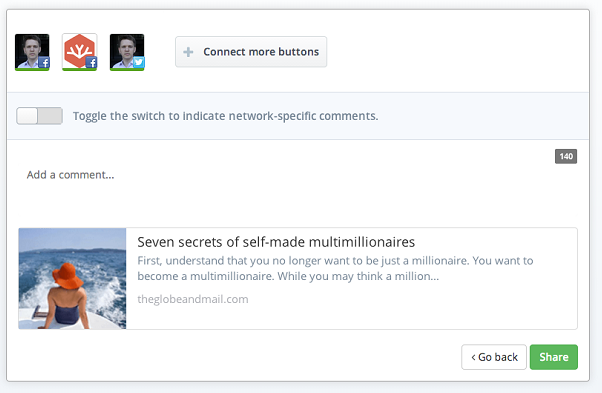 Users will be able to choose from their first connections on LinkedIn, with Crowdlinker suggesting people that may enjoy the content they want to share. For example, if a user wants to share an article on marketing, the tool will suggest people with ‘marketing’ in their job titles from his or her list of connections. Crowdlinker will then send a LinkedIn message to the chosen recipients, though on Facebook and Twitter, its messages may appear as either direct messages or user mentions. Crowdlinker users will also be able to use one link and write one message, broadcasting it from numerous accounts, without having to create a separate message for every account. They will also be able to create separate messages for each social platform, all from one window. For example, for Facebook and Twitter users, Crowdlinker offers a hashtag search feature, which will comb through the piece of content a user wants to share and will find any relevant hashtags that can be added to a post or tweet. Messages and hashtags for Facebook and Twitter can be completely different, yet all created within one window. The idea here is to save users time, and help them decide what to share, Melkoumov says. In developing the tool, Crowdlinker tested it out on three focus groups, finding users were actually really careful about sharing certain pieces as they wanted them to reach the right people – say, their friends, rather than their bosses. “The interesting thing that we found was that for a lot of people, the primary source of all sharing takes place via email. And I found that kind of fascinating,” he says. While Crowdlinker’s social media sharing tool is still in development, the team hopes to have it finished by the end of November. So far, it has more than 400 subscribers interested in checking it out once it’s generally available. The startup also has high hopes for the rest of the year, as it has just landed another $650,000 in funding from the Canada Media Fund and will be hiring three or four more developers and engineers for its team. Crowdlinker will be offering a free version of its social media tool, offering access to up to five connected accounts and accompanying analytics. It will also offer a pro plan of about $10 a month. Correction: In a previous version of this post, one of the features of Crowdlinker’s social sharing tool was not fully explained. The post has since been updated to reflect that users can create separate messages from one centralized window. We regret the error.